“The dead mourns the dead, even as mourners, ironically mourn their own souls,” goes the popular Yoruba saying. 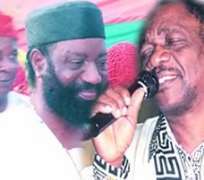 That axiom best captured the condolence visit by the late highlife maestro, Oliver Sunday Akanite, a.k.a Oliver de Coque, to the family of the late Evangelist Sonny Okosuns, following the latter's death on Saturday May 24. The late Highlife singer incidentally gave his last major interview to Daily Sun, part of which is hereby recaptured. The Ogene sound exponent has since gone to the great beyond shortly after failing to respond to circumstances related to cardiac arrest. He was 60 years old. It was a bitter irony that Oliver, who joined the hoard of sympathisers at the Okosun's Lagos home, Wednesday May 28, would soon join his friend and soul mate, Okosuns, in transition. Meanwhile, it has been a harvest of deaths in Nigeria's entertainment scene. The long list include: Sammie Needle, Elder Steve Rhodes who passed on at 82 years, Chief Segun Akpata, ace broadcaster, and lately Oliver de Coque, who never showed any traits of severe ailment until Friday June 20 when he died in a Lagos hospital. Among the departed stars, De Coque and Okosun's deaths shared striking similarity, yet, ironic coincidences. For instance, when Daily Sun encountered the highlife maestro at Okosun's residence, not only did he pay glowing tributes to his bossom friend, he reminisced on their days as beginners in music. Resplendent in a white Agbada (Yoruba traditional attire) the artiste relived fond memories of how Okosuns days were never complete without doses of his hit song, Funny, funny identity. According to De Coque, “ Okosuns used to call me on phone as late as 2 a.m. he would tell me, he was playing my record which he loved best, Funny, funny identity. He (Okosun) used to remind me that he loved the lyrics and the song's arrangement.” In his tribute to the late Oziddi king, De Coque saluted him for his golden voice, his courage and sense for humour. “ We are going to miss him (Okosun) no doubt, remarkably too, when Okosuns played there would be no dull moment. On the coincidence that characterised the musicians' deaths, the news of Okosun's death seeped into the country, while his peers were clinching laurels at the 2008 edition of the Nigerian Music Awards (NMA) in Owerri. Incidentally, De Coque was honoured at the same event with a Lifetime Achievement Award for his immense contributions to the music industry. Similarly, last Friday in Lagos, while musicians converged at the premises of Nigerian Tel;evision Authority (NTA) Victoria Island, for this year's World Music Day, De Coque's death was announced. The fact that the two music veterans passed on while music was being celebrated, lent credence to the fact that they both chose right times to depart. In a swift reaction on the night, the incumbent helmsman of the Performing Musicians Association of Nigeria (PMAN), Tee Mac Omatsola dedicated his performance at the WMD to De Coque. With Okosuns' burial plans still on-going and his interment fixed for July 18, PMAN is ostensibly saddled with the burial rites for the two friends, following recent announcement that the apex musicians' body will raise another burial committee to plan a befitting burial for the two icons. Apparently oblivious of the fact that death was imminent, De Coque's demise again raises questions on musicians' apathy to their state of health. Although he was an accomplished musician having churned out more than 70 albums in his music career, his death was pathetic because he did not wait to bury his mother. Daily Sun gathered that De Coque had delayed the burial because he wanted to complete the mansion he was building in his village. Aside that, the musician also told Daily Sun that he was putting finishing touches to an album which he slated for release next month. According to him, the C.D which would have been a compilation of some of his great compositions, would have been his way of defending the award he won recently and consolidate his feat in the highlife genre. “ You don't win awards and thereafter go to sleep,” the musician told Daily Sun. Born Oliver Sunday Akanite in Ezenifete, Anambra State, the Ogene sound exponent, started his muisc career in 1965, at the age of 17. He played Ekpilo, a form of Ogbo traditional music. Before then, the musician admitted, he had a rough start as he did not win his mother's support to play music. Focused and determined, the young De Coque learnt guitar for four years under one of the best guitarists at that time, named Picolo, from Congo Democratic Republic. After the civil war, the guitarist joined the Lagos-based band, Sunny Agaga and his Lucky Star Band in 1973. He had a stint with Jacob Oluwole's Band, after which he joined Sule Agboola and his Moonlight Star Band. His debut album was Messiah, Messiah (1976) which he released with his Expo 76 Band. Reputably one of Africa's great music ambassadors, Oliver De Coque shot into limelight when he released People's Club in 1979. The album sold 2million copies. Shortly afterwards, he came up with Funny Identity all on Olumo Records. Since then, there was no looking back for the singer, as he kept on churning out albums a much later hit, Mbiri, Kam Mbiri. Before his death, he had more than 70 albums to his credit. With his sonorous voice and exceptional guitar skills, he thrilled generations of Nigerians. Meanwhile, the turning point of his music career came when he substituted the Igbo proverbs and wise-saying which were hallmark of his music with praise-singing.